Air travel can be harrowing for your furry friend, and if you haven’t travelled with your pet before, they may feel especially anxious. Often, the result of these severe stress responses can cause health issues for your pet, including respiratory issues, elevated heart rate, and nausea. Are they up for travel? First and foremost, it’s helpful to determine whether or not your fur baby is equipped for distance travel. Some animals can get so anxious that it may be better for them to remain in the comfort of their own home. Before travelling with your pet, make sure that they will be okay with the noise and the hectic nature of moving around from place to place. 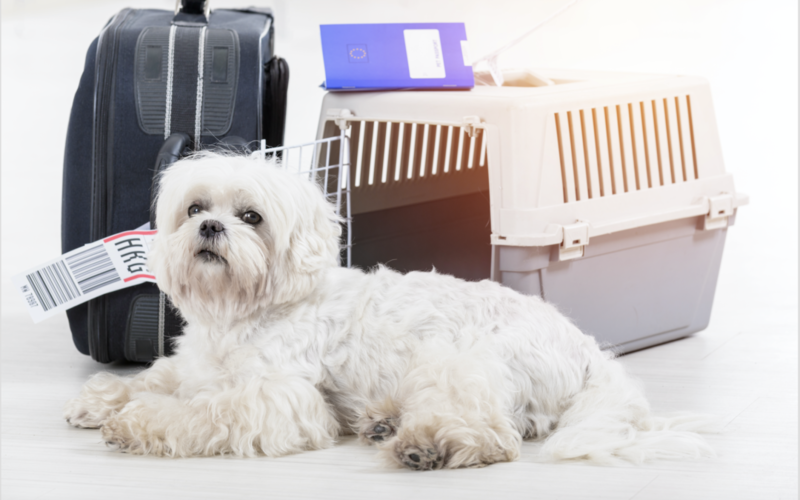 If you are unsure as to whether or not your pet would be equipped for travel, speak with your vet and let them help you make an informed decision. Comforting your pet starts with making sure that they feel safe during travel. If your pet is in a carrier, it can be helpful to line the carrier with their favourite blanket or towel on top of newspaper lining. A few of their toys can also be helpful, as the smells of their favourite things can create a sense of familiarity. Do they need something to help them relax? In some cases (like relocation), leaving your pet at home isn’t an option. What do you do for a pet that is especially nervous, and does not feel safe in their carrier during travel? If your furry friend has severe travel anxiety, sedating them with medication is an option. A lot of people don’t like using this method of calming their pet, so it is always a good idea to talk to your vet about alternatives, such as pheromones or homeopathic remedies. These treatments have been proven to be effective in calming and soothing pets, especially when travelling shorter distances. A special treat at the end of a long journey can be an excellent motivator for your pet, helping them get excited about their destination and encouraging them to be on their best behaviour. On top of that, a special treat can help your pet associate travel with a pleasant experience, making it more likely that they will relax for any future excursions. Travel can be uncomfortable for your fur baby, but if you give them all of the comfort that they need, you’ll make the trip worthwhile for them. For all of your pet relocation needs, contact us today. We can get your furry friend to their destination safe and sound!